Hi everyone. Here's my DT card is for today's challenge at Addicted to CAS. The challenge is open for two weeks, so lots of time to join in ... we'd love to see your cards! 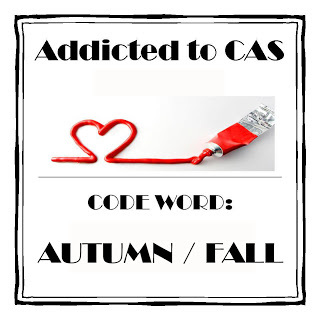 I hope I have inspired you to join in our fun challenge ... Addicted to CAS - Autumn / Fall. Come check out all the wonderful creations by the other Design Team members. Hi Loll so lovely to be here and see another of your stunning creations. Fantastic save but my oh my having to fussy cut all of that !!!! Beautifully coloured images and perfectly CAS as always. Well done you saving the card-I need sticky fingers as I am always dropping those pesky ink pads onto my almost finished cards Grrrr!! Absolutely lovely Loll. She's so cute and I love your paper piecing and touches of glossy accents. This is darling...worth the fussy cutting to save the work..so crisp and fun. Gorgeous card, Loll. Adorable images and wonderful paper piecing. Great save, Loll! Love the girl and flower image. Absolutely darling images and I love your paper-piecing, Loll! Beautiful coloring, too! What a gorgeous card...beautiful coloring! Thank you for your nice comment on my blog! Isn't it annoying when that happens Loll - great recovery job though! Your paper-piecing is perfect, as always - gorgeous colouring too. Hi Loll, What an adorable little girl and her big sunflower! I've dropped my share of inked stamps in the wrong place. I'm glad you managed to save this. It would have been a great loss to have to toss it! Oh Loll, this is just adorable. Great coloring and placement. Loll, your paper piecing and copic colouring skills are outstanding. This is such and adorable card with wonderful images. what a sweet image Loll! 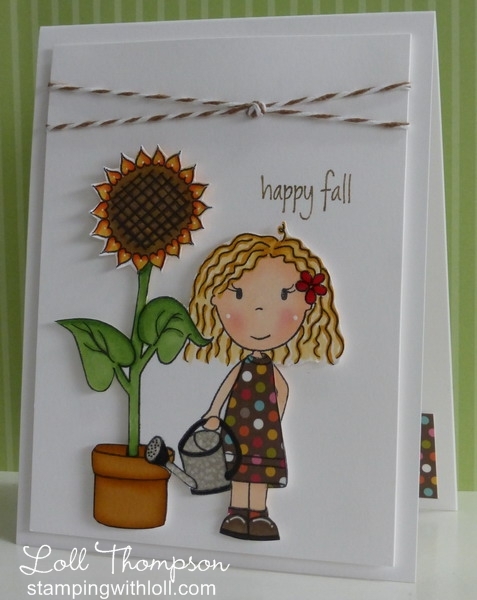 Wonderful coloring on her and the pretty sun flower - I too have dropped a stamp rignt onto my card and had to do some corrective action!! aww!! so cute Loll, great paper piecing. I always love your paper piecing, Loll! It looks fabulous...wish I would remember to do that sometime! lol I can't believe you fussy cut all of that. WOW is all I have to say about that. It looks fabulous. 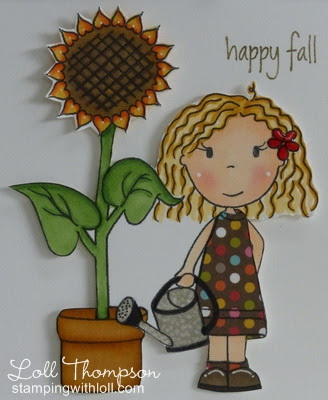 This is so sweet Loll - love that sunflower with the cute girl! We have a neighbor that grows sunflowers that are 6 feet tall! Loll, I really love your popped-up image and your coloring!